The award-winning classic in a new formula environment-friendly. A success story. The best skin of your life begins here. It is the basic skincare product for you in the form of a biphasic peeling, and is derived from aesthetic dermatology. 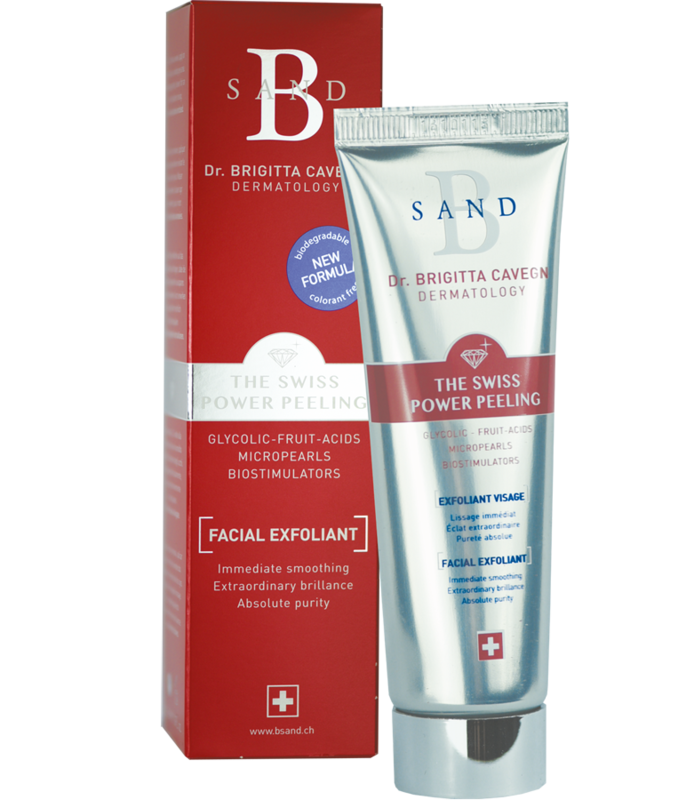 B SAND THE SWISS POWER PEELING was created by Dr. med. Brigitta Cavegn, Swiss dermatologist and expert in facial rejuvenation. It was inspired by the techniques used in aesthetic dermatology: microdermabrasion and chemical peeling. and leaves your complexion bright and radiant. Prepares the skin perfectly for the application of your other skincare products and optimises their effects. The most important step in healthy skin care apart from sun protection. How does B SAND Peeling work? The polycaprolactone granules achieve thorough pore-deep cleansing (abrasive action), without injuring the skin, by removing dead cells of the horny layer (skin scales) when massaged on with circular movements of the hand. Blood flow is stimulated and the skin’s profile is refined. The fruit acid complex (glycolic, lactic, citric, malic, salicylic acids) causes softening of areas of thickening of the horny layer and facilitates the removal of skin scales by breaking up intercellular bridges. The skin becomes softer, smoother and the complexion becomes more uniform. Some components have a mild microbiostatic action and reduce irritation. Biostimulators moisturise the skin; it becomes softer, more elastic and supple. Polidocanol has a soothing action and reduces irritation. Undecylenic acid has a slightly disinfecting activity. slows the overall process of aging. Use once or twice a week on sensitive and dry skin, two or three times a week on greasy skin and skin that is prone to breakouts. Massage gently onto wet skin (mechanical phase). Leave to work for 3-4 minutes (chemical phase), then rinse off with plenty of water. Can I use a skin-care cream immediately after using B SAND? After how many applications of Peel B SAND will I see results? How often can I use B SAND if I have sensitive skin? From what age can B SAND be used? The skin becomes reddened after using B SAND. What should I do? When is it better to apply B SAND? Mornings or evenings? Can the Peel B SAND be applied to other parts of the body? B SAND has been tested on animals? A Peel is a superficial exfoliation treatment of the skin whereby the dead outer layer skin cells are removed - perfectly preparing the skin for subsequent cosmetic or dermatological treatment. Thanks to the fruit-acid combination and bio-stimulators in B SAND, the skin is already hydrated. A skin-care cream or dermatological therapy can therefore immediately be applied. The effectiveness of these treatments is also enhanced thanks to B SANDS perfect preparation of the skin. The skin is noticeably softer, finer and conformer already after the first application. Because the regular application of B SAND shortens and stimulates the regeneration of the epidermis (normal cycle 4-6 weeks) you can expect a pronounced and visible improvement after 3-4 weeks. Application to sensitive skin is recommended 1-2 a week. Massage B SAND gently onto the skin and make sure to use ample water to rinse. Application time should be reduced to 2-3 minutes followed by thorough rinsing. The application sequence may be increased according to skin tolerance. B SAND can be used after the onset of puberty. The 2-phase-peel B SAND has an especially beneficial effect on skin disorders such as pimples and blocked skin pores. Because the circulation is stimulated by the light massaging of the skin, a temporary reddening of the skin is normal. Persisting reddening can be caused by too vigorous massaging, too little rinsing or by over-sensitivity. A cool compress or a simple skin-care cream should bring quick relief. It is recommended that a thorough and intensive cleansing is especially effective and beneficial in the evenings. A peel that has been developed for comparatively delicate facial skin can of course be applied to skin on other parts of the body - bringing an extended feeling of well-being to these areas too. Nor the peeling B SAND either its components has never been tested on animals. It does not contain parabens, mineral oils, animal extracts.